12.00 to Midnight every day including boxing day and bank holidays. About: Fish, Vegeterian and Tandoori Special. Nice atmosphere, beautiful decor, Private dinning room, latest sleek designed bar, House special menu, al a cart and set menu meal, lunch special, afternoon tea, indian special food festival. "If I lived nearby, the KT would probably become one of my favourites..."
Just over five minutes walk from Kennington tube station and right on the main Kennington Road (opposite Edinburgh House) it’s mighty convenient to get to – especially, as it turns out, for politicians. One mid-week evening I met my friend there after work. The interior décor is a pleasant surprise and a departure from your average curry house. The area at the front is bright – as a result of the large front windows. The mid area is sort of relaxed with softer lighting and the rear area (which can be partitioned off for private parties accommodating up to 12 people) has night club inspired soft purple lighting. It’s really pleasant. The staff are welcoming and efficient at getting you to a table – and it’s already comfortably busy without being full at 730pm. While I contemplate the extensive menu I order a diet Coke (£3.50) but am persuaded by the waiter to try the chef’s special Saffron Gin and Tonic (£5.50). As the name suggests it has a yellowish tinge but is surprisingly pleasant – like an ordinary Gin and Tonic but less dry. I admit that as I browse the menu items and chef’s specials (both of which include plenty of vegetarian options – the paneer shashlick - £8.95 looks good and so does the adhari mushroom with ginger and sweetcorn - £7.95) I am torn between trying a classic curry house dish – they are all here – to see how they compare and one of the many rather different items that look tempting. Luckily my friend has the same conundrum so we decide to order a selection and go half and half. We munch through some papadums while we wait for our food – the mango and tamarind chutney is a triumph. For a starter, he has a KT Platter (£6.95) which is good value as it allows us to taste a samosa (crispy slightly chewy outer and light, dry contents), an onion bhaji, a sheek kebab (great seasoning on this meaty lamb classic – a sort of delayed reaction) and the most delightful chunk of the tenderest tandoori chicken in a delightful sauce. I opt for one of my favourites – Bhuna Prawn Puri (£5.95) which arrives – like all the food – beautifully presented on modern white china. For a moment, the food presentation makes me think of upmarket West End restaurants rather than local curry shop. It’s really good. For my main course I had a white fish kofta Fisherman’s stew (£10.95). The sauce was pleasant but not particularly special and the fish was a bit spongy. On the other hand my friend’s choice of the Chef’s Special makonwallah chicken (butter chicken - £10.95) was incredible, really special. The pilau rice (£2.75) was delicately fragrant although it was a relatively small portion. The chana masala (£3.95) was OK but the hot coconut stuffed nan was incredible. Usually when I eat Indian food I don’t have any space for dessert, but on this occasion my friend had his heart set on some vanilla fudge (£4.50) which was a generous portion but too sweet for my taste. On the other hand the waiter’s suggestion of some chocolate and cardamom mousse (£4.95) was a good one – it was fluffy and delicious. There were plenty of staff – who were attentive but not overbearing and the place filled up as the evening wore on. I thoroughly enjoyed my meal although the large party of well spoken young people who arrived at about nine was really noisy – apparently they were young politicians and the KT is a regular haunt for them. I do hope their presence doesn’t cause as much disturbance to regular diners. This was nearly a nine out of ten – but I did feel that at £73.35 (albeit for three courses, but we only had the two gin and tonics and a beer) it was a little expensive. Whilst the décor, service, staff, food presentation and menu selection were really, really good there were one or two dishes whose blandness let down the otherwise fantastic food. If I lived nearby, the KT would probably become one of my favourites. Apparently there is also a branch out in Dulwich. At last we have a Michelin rated restaurant in Kennington, fabulous food and service!!! Came here for my uncle's 70th+ birthday dinner & this is, hands down, the best Indian food I have EVER had. Seen this restaurant grow, so pleased to hear it is now in the Michelin guide. Brilliant to have such high calibre restraunt south of the river. This is a really nice restaurant with great service and exceptional food! I live 2 tube stops away but its well worth the journey and its become a non-local local for me. When my mates come to London I always take them here for a good feed before a night out. I wish I could go every week but its not exactly a cheap restaurant (you get what you pay for though!) They have recently started taking online orders so I can get the exact same grub at home (for quite a bit cheaper) - the only down side of the online ordering is that I don't get to see the guys in the restaurant who are all a really nice bunch, I've been coming here for a couple of years so they know my name and I always get such a lovely welcome. Really lovely restaurant! 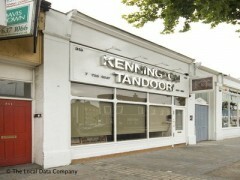 I was expecting 'yet another curry house' but Kennington Tandoori really took me by surprise! It is a beautiful restaurant, really clean and modern looking with stunning food to match. I was very unsure what I wanted to eat (as i can be very indecisive at the best of times!) but the waiter was very patient with me, I really couldn't decide so he helped me choose by firstly asking what meat I wanted, then what sauces I like and he was able to recommend the prefect dish for me. This was such a nice touch as I sometimes find it quite intimidating not really understanding the menu but the guys at KT really made me feel looked after and they seemed to really take pride in their food! I can see why - it was delicious!!! I will definitely be going back very soon! If you want a cheap curry then this probably isn't the pace for you but if you want to try some genuine modern Indian cuisine then you can't get much better than the this! I have been eating here five years - it is my favourite Indian restaurant in London. Great food, efficient friendly staff, good decor. I would highly recommend trying it. I've visited the KT on and off for 5 or 6 years and have always been met with good service and some excellent curries. The staff are well presented, friendly and attentive, without being pushy. The menu is more imaginative than average, pleasing most tastes and even as a vegetarian there is plenty of choice. Choosing an Indian restaurant anywhere can be a risky business, but the KT is a safe choice. I can only assume the previous comments were posted by the rival indian up the road, or must have been very unlucky indeed. As a regular at KT I cannot fault the service, they always recognise us, are scrupulously clean & polite. And the food is superb. Our meal last night: Naan breads light, fresh and piping hot (ask for a garlic chilli naan and you won't be dissapointed), papri ma gosht was delicious with finely sliced lamb in amazing fresh and zingy sauce, lamb patia was perfect - hot & sweet with good sized chunks of lamb. The saag paneer was sweet and creamy with loads of pieces of fresh paneer cheese. The decor is clean and bright, air conditioned. 10 out of 10 every time. Excellent! !